By combining the long-range, high speeds of a speed boat with the deep diving capabilities of a submarine, the Hyper-Sub is a true first-of-its-kind speed boat come submarine in innovation. 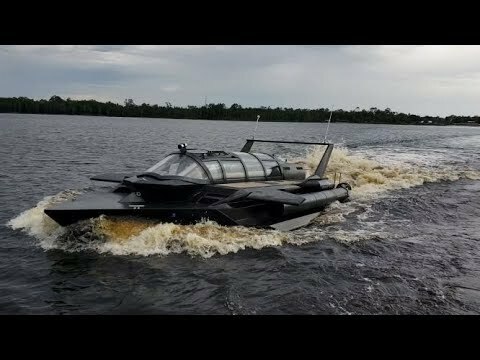 Because it is a speedboat, the Hyper-Sub can be deployed quickly and conveniently from nearly any dock, beach or other typical launch location. Once on the water, the Hyper-Sub can quickly transit to the desired location and, with the flip of a few switches, transition into a submarine. This ease of deployment eliminates the need for costly surface vessel support. The Hyper-Sub achieves this through two major breakthroughs in submersible technology: Hyper-Buoyancy and Modular Design. These two concepts have resulted in an incredibly safe, cost-effective, and scalable submersible watercraft that redefines submersible technology.